It’s contest time! Our Instagram followers have a chance to win a meet and greet Sherry Holmes at the Windsor Build a Dream event on November 8. Use hashtags #WEBuildaDream & #idreamtobe. Five winners will be selected at 8pm on November 5! Build a Dream’s “Sherry Holmes M&G” CONTEST (the “Contest”) takes place from Thursday, November 1, 2018 beginning at 9:00 a.m., Eastern Time (“ET”) and ending Monday, November 5, 2018 at 8:00 p.m., ET (the “Promotion Period”). To receive one (1) entry into the Contest, visit the Build a Dream Instagram page at HYPERLINK https://www.instagram.com/build_adream/ and become a follower by clicking “FOLLOW” on the Build a Dream page. After clicking “FOLLOW”, entrants must access the contest by following the instructions on the “Contest” post, post a photo to their Instagram profile, and tag Build a Dream (@build_adream), and use tag with hashtags #WEBuildaDream and #Idreamtobe. Only one (1) entry is permitted per entrant. It is the responsibility of the entrant to ensure that his/her photo is visible to the Build a Dream account. On Monday, November 5, 2018 (“Draw Date”) at approximately 8:01 p.m., ET (“Draw Time”), five (5) entries will be randomly selected, using a computer-generated selection process, from all eligible entries received. Entrants do not have to be present during the Draw Time to be eligible to win. Build a Dream (the “Sponsor”) will make reasonable attempts to notify selected entrants by direct message. If the selected entrants cannot be directly reached a message will be left and the selected entrant will then have twenty-four (24) hours from the time of notification to claim their prize by contacting the Sponsor. Failure of the selected entrant to contact the Sponsor within the twenty-four (24) hour timeframe or otherwise comply with the Contest Rules will result in the prize being forfeited and the prize will be drawn for again. This rule pertains to all subsequent draws. The Sponsor will contact up to twenty (20) selected entrants, if selected entrants cannot be located by November 8, 2018 the prize will be forfeited. 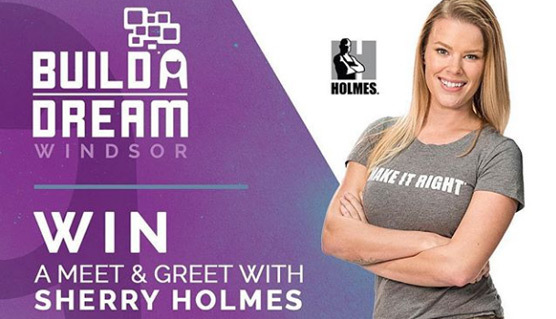 Five (5) meet and greet passes with Sherry Holmes at the Build a Dream event on November 8, 2018. (approximate value $50 CAD each). The approximate total value of all prize packages is $250.00 CAD. No cash option available. Prizes are non transferable. Sponsor reserves the right to substitute all or a portion of the prize for a prize or prizes of equal or greater value for any reason including should all or a portion of the prize become unavailable. The prize must be claimed at the Build a Dream registration desk by Friday, November 8, 2018 no later than 6:00 p.m. In order to claim the prize, the winner must produce valid government-issued or school-issued photo identification to a Build a Dream Representative (“Representative”) and correctly answer, unaided, a time-limited (90 seconds), mathematical, skill-testing question. The winner will also be required to sign a standard Release, including publicity release, confirming compliance with the Contest Rules and acceptance of the prize as awarded and releasing the Sponsor, Facebook Inc., and their respective parent companies, affiliates, subsidiaries, agencies, agents, respective directors, officers, employees, representatives, sponsors, successors and assigns from any and all liability for any loss, harm, damages, claims, costs, causes of action or injury whatsoever including, but not limited to personal injury, accident or death, property damage, disappointment or inconvenience arising from any act, omission or negligence whatsoever relating to the Contest or the receipt, ownership, possession or use of any prize. Failure to claim the prize in accordance with the information set out above will result in the prize being forfeited. All answers to skill-testing questions are final. The selected entrant must comply with all Contest Rules before being declared a winner and any misrepresentation of fact as to the selected entrant’s eligibility, whether intentional or unintentional, will be sufficient cause to forfeit any prize award. Should a selected entrant incorrectly answer the skill-testing question, or otherwise fail to comply with all the Contest Rules, the selected entrant will be disqualified from Contest participation and the prize will be forfeited and will not be drawn for again. Prizes that are not claimed in accordance with these Contest Rules will not be awarded. All times are approximate and may be adjusted at the sole discretion of the Sponsor. No purchase is necessary to participate in this Contest. Prizes must be accepted as awarded and are non-transferable. All prize claim verification information is subject to verification and will be void if not obtained through legitimate channels, or if not original, or if illegible, altered, forged, defaced, mutilated or tampered with in any way, or if not obtained in accordance with these Contest Rules. By participating in this Contest, an entrant grants to the Sponsor the right to use his/her name, mailing address including city of residence, telephone number, and e-mail address (“Personal Information”) without further permission or compensation for the purpose of administering the Contest including, but not limited to, contacting and announcing the winner and acknowledges that the Sponsor may disclose the Personal Information to third parties or service providers of the Sponsor in connection with the foregoing. By accepting a prize in this Contest, winner and his/her guest, if applicable, grants to the Sponsor the right to use their Personal Information including any photographs, likeness or comments for publicity and promotional purposes relating to the Contest without compensation or further permission and acknowledges that the Sponsor may disclose the Personal Information to third parties or service providers of the Sponsor in connection with the foregoing. By participating in this Contest, an entrant releases and holds harmless the Sponsor, Facebook Inc., and their respective parent companies, affiliates, subsidiaries, agencies, agents and their respective directors, officers, employees, representatives, sponsors, successors and assigns from any and all liability for any loss, harm, damages, claims, costs, causes of action or injury whatsoever including, but not limited to, personal injury, accident or death, property damage, disappointment or inconvenience arising from any act, omission or negligence whatsoever relating to the Contest or the receipt, ownership, possession or use of any prize. By entering this Contest, entrants agree to be bound by the Contest Rules and decisions of the Sponsor which decisions shall be final and binding in all matters related to the Contest. The Sponsor reserves the right to alter, modify, amend or cancel all or any portion of this Contest at any time for any reason without notice. This Contest is open those who are at least fourteen (14) years of age through eighteen (18) years of age and are residents of Canada (excluding Quebec) or the United States of America (excluding Florida, New York, Rhode Island and Puerto Rico). Entrants must present valid government-issued or school-issued photo identification upon request. In the event that an ineligible person participates in the Contest and is chosen as the winner, this person will be disqualified from winning the prize and the prize will be forfeited and will not be drawn for again. This Contest is subject to all federal, provincial, municipal and state laws of Canada and the United States of America. All issues and questions concerning the construction, validity, interpretation and enforceability of these Contest Rules or the rights and obligations as between the entrant and the Sponsor in connection with the Contest shall be governed by and construed in accordance with the laws of the Province of Ontario including procedural provisions without giving effect to any choice of law or conflict of law rules or provisions that would cause the application of any other jurisdiction’s laws. All times stated are local Windsor, Ontario times and all values stated are in Canadian dollars. The Sponsor is not responsible for lost, late, mutilated or illegible entries nor for electronic transmission errors or delays resulting in omission, interruption, deletion, defect, delay in operations or transmission, theft or destruction or unauthorized access to or alterations of entry materials, or for technical, hardware, software, or telephone failures of any kind, lost or unavailable connections, fraud, incomplete, garbled, or delayed computer transmissions, whether caused by the Sponsor, users or by any of the equipment or programming associated with or utilized in the Contest or submissions which may limit, restrict, or prevent a participant’s ability to participate in this Contest. If this Contest is interfered with, or it is impracticable to conduct, or continue to conduct in whole or in part, as a result of fire, explosion, power failure, acts of God, civil commotion and/or labour unrest such as strikes, slow-downs, lock-outs, picketing or boycotts, the Sponsor, and their respective parent companies and their respective officers, directors and employees shall be released from any and all responsibility and/or liability whatsoever arising from such interference or impracticability, and the Sponsor shall have the option, at its sole discretion, to cancel, extend or reschedule the Contest without liability. In the event of discrepancy or inconsistency between the terms and conditions of the Contest Rules and any disclosures or other statements contained in any Contest related materials including, but not limited to, any entry form or advertising collateral, the terms and conditions of these Contest Rules shall prevail. The Contest is in no way sponsored, endorsed or administered by, or associated with, Facebook, Inc. By entering this contest, you understand that you are providing your information to Build a Dream and not to Facebook Inc.
All federal, state, provincial and local taxes, licensing, custom duties and the like amounts and any other fees on prizes, if any, are the responsibility of the winner and the winner authorizes the deduction of such taxes, if any, from the prize(s) to the extent required by law. This Contest is sponsored by Build a Dream, Windsor, Ontario .